Patrick Hruby: The Beginning of the NCAA's End? Simple. Direct. Downright literal. And notable for the four letters - N-C-A-A - it leaves out. The College Football Playoff (TM!) is almost here, and in this week's Atlantic Sports Roundtable, we ask: what does this mean for the future of the National Collegiate Athletic Association? Patrick Hruby: ... Forget administrative incompetence, the ongoing O'Bannon lawsuit, the fundamental unfairness and unsustainability of amateurism, the fact that college athletic directors are increasingly fed up. The biggest reason the NCAA is teetering is that the big-time football schools don't need the organization. Not anymore. Not when they can make tons of money without NCAA interference. In men's basketball, the association acts as a profit-skimming middleman, selling the multibillion-dollar television rights to the popular postseason basketball tournament and spreading the spoils around; in football, the power schools and conferences broker their own broadcast deals for even larger piles of cash, which they get to control and keep. Hampton Stevens: ... With the NCAA a shell of itself, there will be no one to enforce their innumerable, inscrutable, mostly exploitative rules governing student-athletes. There will be no compliance officers. That means, simply, no one will comply. With nobody to stop boosters from giving cash and gifts, and no meaningful penalties for players taking them, it's simply bound to happen. Now you might say the universities still won't feel liking sharing. With alumni handing out money almost over the table, why would they? They will. Because of the very same, insane, win-at-all cost mentality in college sports that's so often (rightfully) decried. Jake Simpson: ... 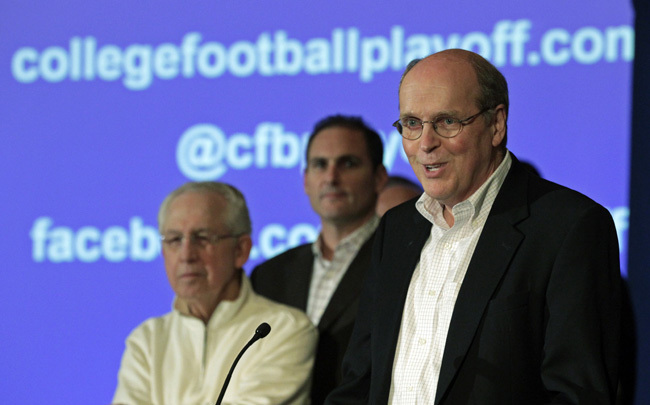 The athletes may get paid eventually, but the CFP won't be the tipping point. That will be a labor-friendly appellate court panel that forces the Supreme Court to hear a case like Ed O'Bannon's.